On Nov. 19 1993, GM and Toyota signed a deal to sell Cavaliers in Japan by 1996. Aiming for the sky, GM wanted to sell 20,000 units a year. They sold Just 36,228 in its entire 4 year run. Toyota and GM were no strangers to each other, after all they had an alliance since 1984 with the joint venture called NUMMI (New United Motor Manufacturing, inc) in good old Fremont California. The Fremont plant in its heyday churned out Chevy Novas, Geo Prizms/Toyota Corollas, Pontiac Vibes and Toyota Tacomas. The whole operation eventually imploded when GM pulled out of the alliance as they entered bankruptcy. Tesla eventually ended up buying the carcass of the NUMMI plant and the rest is history as they say. Now let’s go on that yellow brick road back to the NUMMI period where anything was possible. Now you have to give credit where credit is due, General Motors had some serious balls to try to take on the Japanese market with a Cavalier. We have zero problems embracing Japanese vehicles here with their outstanding reliability and craftsmanship. It’s a one sided relationship as the Japanese market has always been elusive to U.S. auto manufacturers. GM’s newest J-body for 1995 was leaps and bounds ahead of it’s predecessor. wheelbase was stretched 3" and it’s track widened by 2" in an effort to increase cabin room. All new aerodynamic sheetmetal cut through the air with a drag coefficient of 0.36. Dual airbags and ABS were standard in 1995. Macpherson strut front suspension was retained. Suspension tweaks to the rear trailing twist beam was a coil over shock design that kept the shock and spring in-line to directly transmit road inputs into the body structure for a less jarring ride. LN2 I4 SFI ohv 120hp and 130 lb ft through a 3 speed auto or 5spd manual. A new 4spd auto wouldn’t show up until 1996. The 1995 year only Z24 had the reworked LD2 DOHC “Quad4" 2.3L. The Quad 4 was GM’s newest and most sophisticated 4 cylinder they’ve ever made from scratch. In peak form pre-1995, the H.O. 2.3L Quad4 (LD0 block) pushed 180hp NA with Oldsmobile variants pushing 190 hp NA. They were highly criticized for their crude NVH levels since GM decided to skip the balance shafts for moar powahhh!! The reworked LD2 for Cavalier duty rectified that issue by throwing in the balance shafts for a smoother quieter ride. It was good for 150HP and 150 lb ft tq with a reduction of redline from 6800 to 6500 rpm. By 1996 the LD2 would be replaced by the LD9 “Twincam” that saw a bore decrease from 92 t0 90mm and stroke upped from 85 to 94mm. Displacement came in at 2.4L with hp at 150 and tq at 155 lb ft.
For it’s October 1995 (model year 1996) JDM debut, GM gave all Toyota Cavalier’s their most advanced 4 cylinder as standard equipment. The iron block, aluminum head DOHC 16v Twincam would lead the charge into territory few US cars dare to wander. The sole transmission choice for the Toyota Cavalier was the 4T40-E 4 spd Auto and pricing started at 2.05 million yen or about $18,000 in today’s money. Subtle design changes for JDM include configuring it for right hand drive and having additional fender mounted turn signals to comply with Japanese regulations. Initial interest was there, probably morbid curiosity more than anything. Halfway through its debut year, it moved 6,700 cars into the hands of Japanese families. Years end, it peaked at 11,467 cars sold. It would never touch those numbers again. The demand just wasn’t there and the Cavalier was in a saturated segment fighting an uphill battle. Sales were no where near projections. 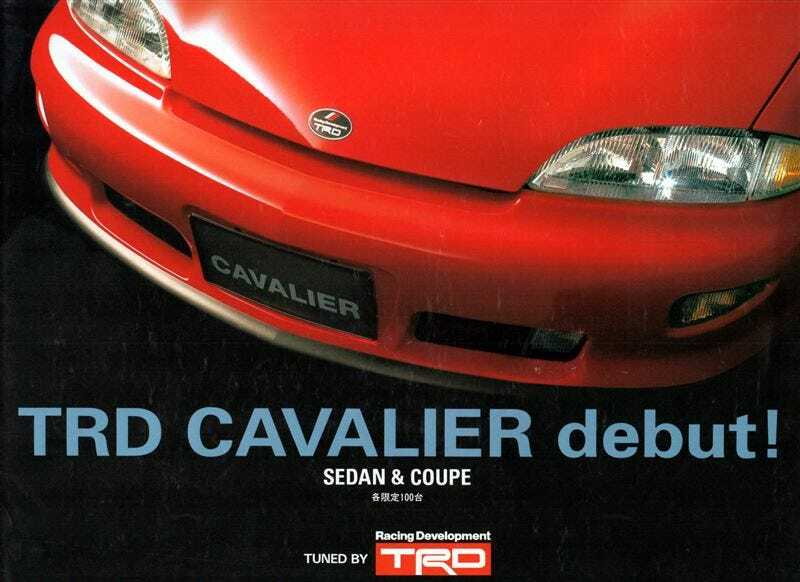 In an effort to boost interest, Toyota had it’s TRD division have it’s way with the Cavalier to make it appeal to the Japanese market tastes. The TRD Cavalier which had some suspension tuning and styling upgrades. The Cavalier did do some Japanese circuit racing in the All Japan GT Championship as a GT300 race car for 1997. It was the only FWD car in the field and had a modified Toyota 3S-GE engine out of an MR2. The Toyota and Chevrolet Cavalier did get a refreshed fascia in 1999. All in all, GM and Toyota pulled the plug on April 12th 2000 with a final tally of 36,228 units sold in its 4 year run. It’s better to have loved and lost than to have never loved at all. GM tried and didn’t get the results they wanted...but they tried and I can’t fault them for that. I’m sure out there there’s some fringe fan club somewhere out there in Japan for these blacksheep Toyota’s, or not. It doesn’t matter. It’s just neat that something like this even happened at all. Thanks for reading!